Yes, yes. It’s another LuLaRoe post! As the school year winds down and my launch date approaches, I have been going 100% in with all things LuLaRoe. I have to admit, all the bright and pretty images have been making my soul feel so happy! Want to join in on the launch party fun?! Click the image above to be taken to my private VIP group on Facebook! I’ve been getting tons done and I found that it was hard to recall exactly what I’ve been doing during all of this time. I’m blessed with the ability to be able to keep track of ridiculous amounts of tasks mentally but I know that it can be very challenging for others. 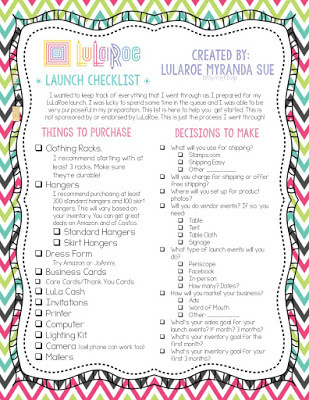 So, I put together this LuLaRoe launch checklist that contains everything I’ve been going through to get ready for the next couple weeks. I’m sure that the list will change over the next two weeks and I promise to edit it if I feel that anything needs changed but I feel like this will give you a pretty solid start! Guess what…the checklist is yours…FREE. Just click on the download button below to be taken directly to the link where you’ll be able to download it to save forever OR print the PDF file. Let’s discuss some of the items above. First of all…shopping. I’ve found some clothing racks at a local warehouse that are going to be perfect for my business. I know that doesn’t help most of you. I do suggest looking into fixture warehouses in your area. You can also check out Bed, Bath & Beyond or Amazon. Costco has their 35 pack of velvet hangers on sale right now for $7.99. They’re normally $9.99. This post is written in June of 2016 so they may not be on sale by the time you read this. I’ll be picking up a ton of those. I’ll checkout some skirt hangers on Amazon until I can upgrade to higher quality skirt hangers. I have to watch my budget in certain areas and hangers are one of them for now. I’m really stuck with deciding between a solid black dress form on Amazon or a cute Paris themed one from JoAnn’s. The one at JoAnn’s is cheaper but it’s not as tall either. Ugh…decisions! I think that both of these items are going to really help me host more professional Periscope and Facebook live sales! I ordered a bunch of free mailers from USPS. I set up an account with them. I also ordered these mailers from Amazon because I want to double up my bags just in case something happens to the outer packaging! Clothing is one thing that you want to keep extra safe!! While there are tons of cards that you can download and edit yourself from the LuLaRoe assets and there are also tons of items that you can order from LuLaRoe Custom, I opted to order custom made cards from Etsy. If you just run a search on Etsy, you’re going to find TONS of options. I’m working on some hand-made items to use during my photo sessions and I’ll make another post later detailing all of my LuLaRoe creations as I get set. 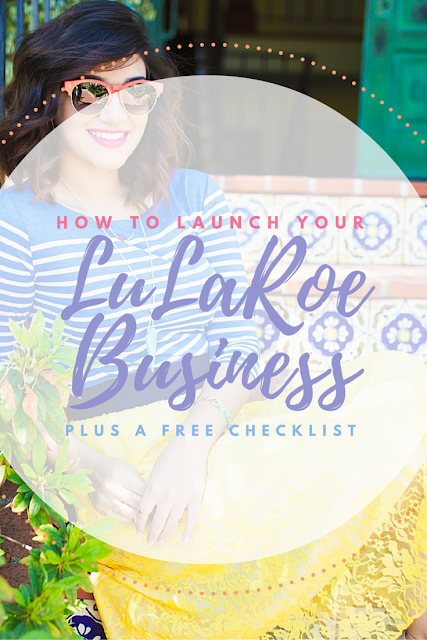 Want to chat about any of the steps that I’ve been taking to prepare for launching my business? 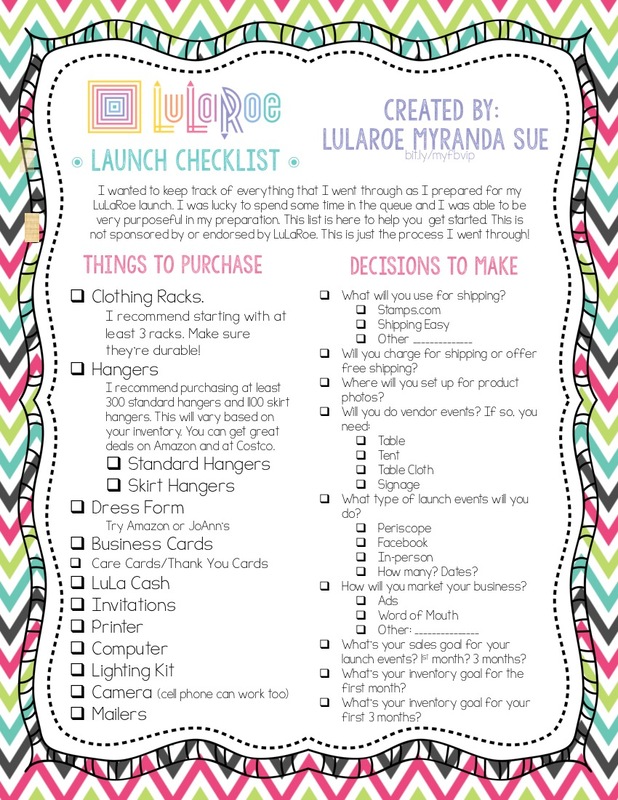 Want to chat about becoming a Fashion Consultant with LuLaRoe? Just want some LuLaRoe styling tips? Leave a comment below or email me! ← Reinforce & Review with Math Games! Love your post. I'm a queebie now and just getting started.